One of my worst nightmares almost came true yesterday. I had just flown from Austin to Seattle and I was walking through baggage claim when I made my awful discovery. An image of my computer tucked in snuggly with the SkyMall catalog and the airplane emergency procedures brochure set off alarm bells in my head. I had left my computer on the plane. Frantically, I turned around and headed for the SouthWest ticket counter, where I breathlessly shared my horror with the agent. She nodded slowly, and then casually called the gate. Didn’t she know this was an emergency? I felt my tension and my annoyance rising. Why wasn’t she grabbing me and sprinting with me to the gate? What if the plane left? What if my computer was gone? On the plane I had decided my focus for my trip to the West coast was to practice surrender. As my friend don Jose Ruiz would say while pointing up to the sky, “Good one!” Leaving my computer on the plane was one fabulous opportunity life was gifting me to practice surrendering. I took a deep breath and watched how my fearful assumptions had my body and mind knotted up like a tangled fishing web. As the ticket agent printed out a ticket for me to go back through security and see if anyone had found my computer, I breathed out all my assumptions. While I waited in the long line at security, worst-case scenario assumptions started spiking my stress level again. Assumption #1: If I didn’t get to the gate quickly enough my computer would be gone. Assumption #2: If this line didn’t move faster I was going to be late for my talk at a local bookstore. Each time I cleared one assumption, the other one seemed to pop up like a weed. My mind kept screaming “this is an emergency!” and my body responded with adrenaline and fear. Anytime we believe an assumption, we are no longer in the present. What helps weed out pesky assumptions is showing up where we are, noticing our surroundings, and telling ourselves the truth of this moment. Over and over and over again. So I kept breathing calmness, noticing who was around me, and staying present with being in line. There was nothing I could do to make it move faster. I was going to make my talk, or I was not going to make my talk. My computer had either been found, or it was missing. It is such a temptation for our mind to make serious drama out of situations with no known outcome. I see it as a training problem. Most of us don’t know how, or never take the time to properly train our minds. Imagine that your mind is like a wild dog that you bring into your house and then leave alone for days. Can you imagine the disaster it would create? Minds left unattended tend to wreak the same kind of wild dog havoc. It takes time and patience to retrain our mind away from destructive habits like worst-case assumptions. 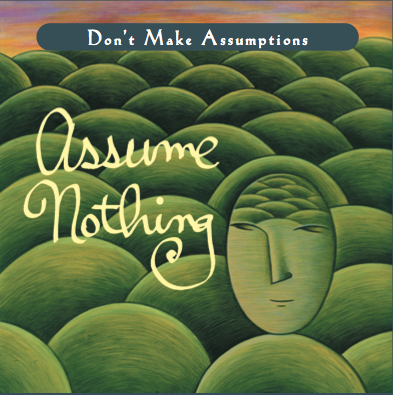 Happily situations like forgetting your computer, not getting a phone call back, or waiting for test results come along to help us practice staying in the wide-open no-assumptions zone. Keep inviting your mind to heel quietly by your side. When you look away and your mind sneaks off and runs amok, bring it back gently but firmly into the present moment. Breathe. Be here. Now. When I finally made it back to the gate, the gate agent told me my computer had been found, but then he discovered it had gone missing again. He kept looking in the drawer he had put it into and scratching his head. I kept breathing and waiting. Heel! I said to my mind over and over again. A few announcements later and after a few conversations among SouthWest staff my computer was discovered in another drawer. As I clutched my computer to my heart and headed back to baggage claim, I said a silent “thank you!” and sighed in relief. Despite the delay I even made it to my talk on time. Assumptions or no assumptions, everything worked out fine. And I got another reminder that even in “emergencies” the less assumptions, the less stress. This week: Watch for any assumptions that create stress, and practice heeling your mind into this present moment.